Soden, Aisling M. (2008) The initiation and evolution of ignimbrite faults, Gran Canaria, Spain. PhD thesis, University of Glasgow. Understanding how faults initiate and fault architecture evolves is central to predicting bulk fault zone properties such as fault zone permeability and mechanical strength. The study of faults at the Earth’s surface and at near-surface levels is significant for the development of high level nuclear waste repositories, and CO2 sequestration facilities. Additionally, with growing concern over water resources, understanding the impact faults have on contaminant transport between the unsaturated and saturated zone has become increasingly important. The proposal of a high-level nuclear waste repository in the tuffs of Yucca Mountain, Nevada has stimulated interest into research on the characterisation of brittle deformation in non-welded to densely welded tuffs and the nature of fluid flow in these faults and fractures. The majority of research on the initiation and development of faults has focussed on shear faults in overall compressional stress regimes. Dilational structures have been examined in compressional settings e.g. overlapping faults generating extensional oversteps, or in normal faults cutting mechanical layered stratigraphy. Previous work has shown the affect mechanical stratigraphy has on fault dip angle; competent layers have steeply dipping segments and less competent layers have shallowly dipping segments. Displacement is accommodated by shear failure of the shallow segments and hybrid failure of the steeply dipping segments. As the fault walls of the shear failure segment slip past each other the walls of the hybrid failure segment are displaced horizontally as well as vertically thus forming dilation structures such as pull-aparts or extensional bends. Work on truly extensional faults has been at the kilometre scale of fissure swarms in rift systems where the focus is on fault geometry and direction of fault propagation. This study examines dilational faults with offsets of centimetres to 10’s of meters within moderately and densely welded ignimbrite units on the caldera island of Gran Canaria, Spain. Through the investigation of fault populations within different ignimbrite units I have examined how the fault architecture changes with accumulated displacement, identified the factors controlling fault core evolution and using these observations developed a new model for the initiation and growth of dilational faults in ignimbrites. The faults in this study do not have a linear correlation of increasing fault core thickness with displacement. Fault core width varies along fault dip and the largest offset faults have the narrowest fault cores. Furthermore, the damage zone joint frequency shows a limited increase with increasing displacement and faults and joints are sub-parallel. From these observations I have developed a new model for fault initiation and evolution in which the petrophysical properties of the host rock are the primary control on fault architecture. Faults initiate on existing sub-parallel joints and grow by the incorporation of material from joint surfaces and joint bound slabs. The growth of the fault depends on the joint spacing and the competency of the host rock. In densely welded ignimbrites, joint spacing is controlled by sub-layers within the ignimbrite unit which are formed by flattening and stretching of fiamme. 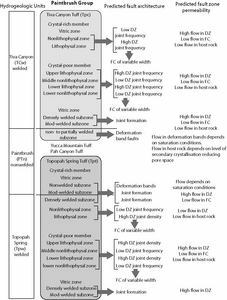 In moderately welded ignimbrites, fiamme and lithic inclusions in the ash matrix act as sites of joint initiation; the greater the abundance of such flaws the higher the joint frequency. Whether fault growth is promoted or inhibited depends to some extent on the competency of the material. Faults cutting ash-rich friable units have narrow fault cores regardless of displacement. This suggests that the material is easily abraded in the fault core inhibiting fracturing of the host rock and incorporation of new material. Hence host rock fabric and composition have an important influence on fault architecture in these ignimbrite units. The other influence on fault evolution is the tensile stress regime in which faulting occurs. The faults in this study form by hybrid failure and so have both vertical and horizontal displacements. The dilation of existing joints causes slip on the joints and allows material to fall into the joint forming a fault core. This work identifies distinct differences between the mechanism of dilational fault initiation and resultant fault architecture compared to that of shear faults. The observations made in this study indicate that the host rock petrophysical properties, stress regime at time of faulting (tensile or compressive) and confining pressure are primary influences on fault architecture and not displacement; contradicting the widely accepted fault thickness-displacement scaling relationship. I suggest that the architecture of dilational faults can be predicted by examining the host rock properties and using the data from this study have developed a framework that illustrates how ignimbrite host rock properties may affect deformation structures. Such frameworks for individual lithologies may be more useful in predicting fault zone properties as opposed to global scaling relationships. The results of this study have implications for conceptual models of fluid flow based on fault architectures predicted using the thickness-displacement relationship. Fault evolution, Fault architecture, Ignimbrite petrophysical properties.